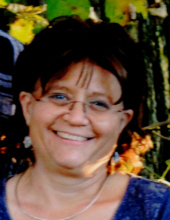 Karen Marie (Glick) Hedrick, 47, of Bridgewater, died on Saturday, December l, 2018, at home surrounded by her family. She was the daughter of J. D. and Becky Glick of Bridgewater. Karen was born on March 11, 1971, in Waterloo, Iowa. Karen was in her 25th year as bookkeeper/secretary at John Wayland Elementary School where she helped organize their Relay for Life team. Karen was actively involved in Bridgewater Little League and Diamond Dawgs baseball teams in support of her sons’ participation. She was an active member of Sunrise Church of the Brethren in Harrisonburg where she served as treasurer for the past eleven years and sang in the choir. She was a 1989 graduate of Harrisonburg High School and a 1993 graduate of Bridgewater College. She loved photography, crafting, gardening, and hiking in the Shenandoah National Park. Karen is survived by her parents, two sons, Zach Hedrick and Ben Hedrick, and maternal grandmother, Emma Jean Flory of Bridgewater. She is preceded in death by her birth mother, Peggy Robinson Glick, and brother, Brian Daryl Glick. She is also preceded in death by grandparents, Norman and Hannah-Frances Glick, Emmert Flory, Jr., and Paul and Mary Howe Robinson. Burial will be private at Oak Lawn Cemetery in Bridgewater. A celebration of her life and faith will be held at 2:30 p.m. on Saturday, December 8, at the Bridgewater Church of the Brethren. There will be opportunity to visit with the family at Johnson Funeral Home in Bridgewater on Friday, December 7, 5:00 to 8:00 p.m., and also following the memorial service on Saturday. Memorial contributions may be made to Sunrise Church of the Brethren (1496 S. Main Street, Harrisonburg 22801) or American Cancer Society (420 Neff Avenue, Suite #210, Harrisonburg 22801). To send flowers or a remembrance gift to the family of Karen Marie (Glick) Hedrick, please visit our Tribute Store. VIsitation with the family will follow the memorial Service. "Email Address" would like to share the life celebration of Karen Marie (Glick) Hedrick. Click on the "link" to go to share a favorite memory or leave a condolence message for the family.